Nowadays, combining the different sources of information to improve the biological knowledge available is a challenge in bioinformatics. One of the most powerful methods for integrating heterogeneous data types are kernel-based methods. Kernel-based data integration approaches consist of two basic steps: firstly the right kernel is chosen for each data set; secondly the kernels from the different data sources are combined to give a complete representation of the available data for a given statistical task. We analyze the integration of data from several sources of information using kernel PCA, from the point of view of reducing dimensionality. Moreover, we improve the interpretability of kernel PCA by adding to the plot the representation of the input variables that belong to any dataset. In particular, for each input variable or linear combination of input variables, we can represent the direction of maximum growth locally, which allows us to identify those samples with higher/lower values of the variables analyzed. The integration of different datasets and the simultaneous representation of samples and variables together give us a better understanding of biological knowledge. With the recent rapid advancements in high-throughput technologies, such as next generation sequencing, array comparative hybridization and mass spectrometry, databases are increasing in both the amount and the complexity of the data they contain. One of the main goals of mining this type of data is to visualize the relationships between biological variables that are involved . For instance, visualizing gene expression guides the process of finding genes with similar expression patterns. However, due to the number of genes involved, it is more effective to display the data by means of a low-dimensional plot. Here we focus on the problem of reducing dimensionality and the interpretability of the resulting data representations. 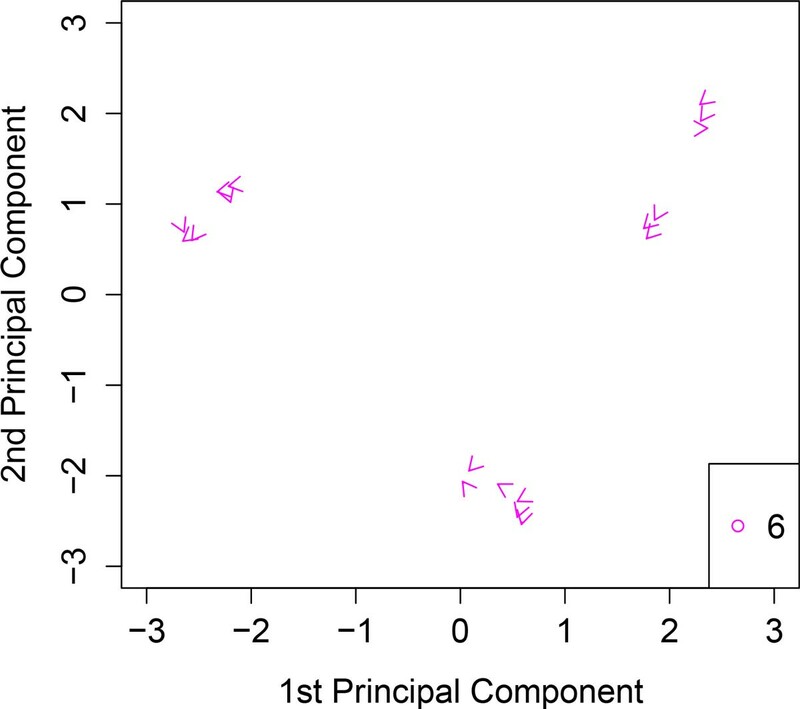 Principal component analysis (PCA) has a very long history and is known to be a very powerful tool in the linear case. 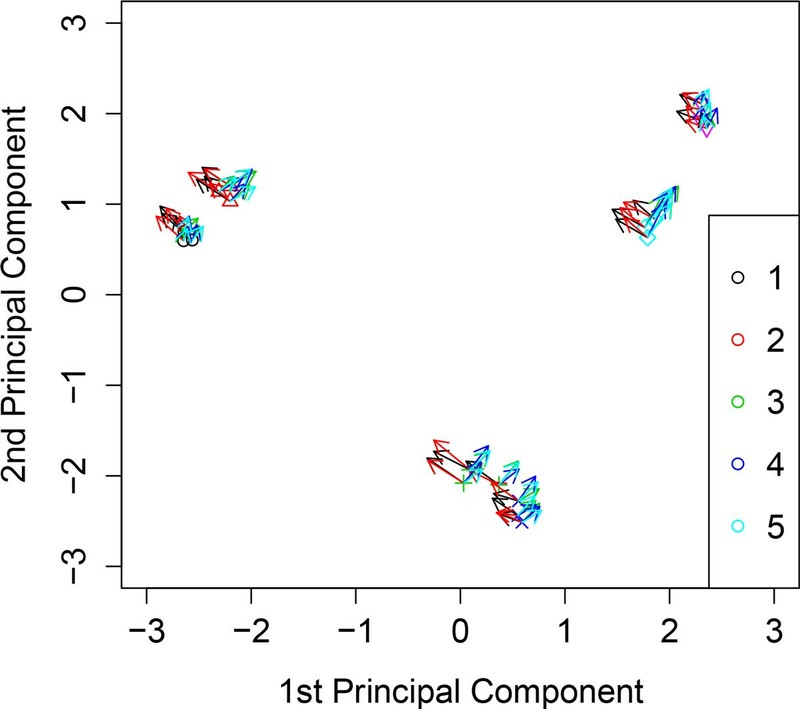 PCA is used as a visualization tool for the analysis of microarray data  and . However, the sample space that many research problems deal with is considered nonlinear in nature; for example, the sample space of microarray data. One reason for this nonlinearity might be that the interactions of the genes are not completely understood. Many biological pathways are still not fully understood. So, it is quite naive to assume that genes are connected in a linear fashion. Following this line of thought, research into reducing the nonlinear dimensionality for microarray gene expression data has increased. Finding methods that can handle such data is of great importance if we are to glean as much information as possible from them. Kernel representation offers an alternative to nonlinear functions by projecting the data into a high-dimensional feature space, which increases the computational power of linear learning machines  and . Kernel methods enable us to construct different nonlinear versions of any algorithm which can be expressed solely in terms of dot products; this is known as the kernel trick. Kernel machines can be used to implement several learning algorithms but the interpretability of the resultant output representations may be cumbersome, because input variables are only handled implicitly . Nowadays, combining multiple sources of data to improve the biological knowledge available is a challenging task in bioinformatics. Data analysis of different sources of information is not simply a matter of adding the analysis of each separate dataset; instead it consists of the simultaneous analysis of multiple variables in the different datasets . Some of the most powerful methods for integrating heterogeneous data types are kernel-based methods  and . We can describe kernel-based data integration approaches as using two basic steps. Firstly, the right kernel is chosen for each data set. Secondly, the kernels from the different data sources are combined to give a complete representation of the available data for a given statistical task. Basic mathematical operations such as multiplication, addition, and exponentiation preserve properties of kernel matrices and hence produce valid kernels. The simplest approach is to use positive linear combinations of the different kernels. In this work, we analyze the integration of data from several sources of information using kernel PCA, from the point of view of reducing dimensionality and extending previous results . Moreover, we improve kernel PCA interpretability by adding to the plot the representation of the input variables that belong to any dataset. In particular, for each input variable or linear combination of input variables, we can represent the direction of maximum growth locally, which allows us to identify those samples with higher/lower values of the variables analyzed. Therefore the integration of different datasets and the simultaneous representation of samples and variables together give us a better understanding of biological knowledge. This paper starts by briefly reviewing the notion of kernel PCA (Section 2). Section 3 contains our main results: a set of procedures to enhance the interpretability of kernel PCA when multiple datasets are analyzed simultaneously. We then present our results and apply them in parallel to analyze a nutrigenomic study in mouse . Kernel methods enable us to construct different nonlinear versions of any algorithm which can be expressed solely in terms of dot products, this is the case of kernel PCA. Kernel PCA can be used to reduce dimensionality, thereby improving on linear PCA, but the interpretability of the output representations may be cumbersome because the input variables are only handled implicitly. Data integration and representation of input variables. Representation of linear combinations of input variables. Revealing the interpretability of input variables. To illustrate these procedures we use an example from metabolomics and genomics. The datasets come from a nutrigenomic study in mouse . Forty mice were studied and two sets of variables were acquired: expressions of 120 genes measured in liver cells; and concentrations (in percentages) of 21 hepatic fatty acids (FAs) measured by gas chromatography. Biological units (mice) are cross-classified according to two factors: genotype, which can be wild-type (WT) or PPARα-deficient mice (PPAR); and diet, with 5 classes of diet in accordance with the FA composition. The oils used for the experimental diet preparation were: corn and rapeseed oils (50:50), as the reference diet (ref); hydrogenated coconut oil, as a saturated FA diet (coc); sunflower oil, as an ω 6 FA-rich diet (sun); linseed oil, as an ω 3 FA-rich diet (lin); and corn, rapeseed and fish oils (42.5:42.5:15), as the fish diet. In the study, it cannot be assumed that variations in one set of variables cause variations in the other; we do not know a priori if changes in gene expression imply changes in FA concentrations or vice versa. Indeed, the nuclear receptor PPARα, which acts as a ligand-induced transcriptional regulator, is known to be activated by various FAs and to regulate the expression of several genes involved in FA metabolism. It should be noted that the main observations discussed in , which were extracted separately from the two datasets by both classical multidimensional tools (hierarchical clustering and PCA) and standard test procedures, are also highlighted by kernel PCA graphical representations. In order to achieve interpretability we add supplementary information into kernel PCA representations. We have developed a procedure to represent any given input variable on the subspace spanned by the eigenvectors of C ̃ (see Methods). where Z s is in the form of (7). d Z s i d s s = 0 = ∂ K ( y , x i ) ∂ y k y = a .
K ( y , x i ) = exp ( - c y - x i 2 ) = exp - c ∑ t = 1 n ( y t - x i t ) 2 .
d Z s i d s s = 0 = ∂ K ( y , x i ) ∂ y k y = a = - 2 c K ( a , x i ) ( a k - x i k ) . d Z s i d s s = 0 = - 2 c K ( x β , x i ) ( x β k - x i k ) . To illustrate our procedure we introduce a toy example. We have generated a dataset which has 18 points in 6-dimensional space. Coordinates of the points are selected in order to distinguish 3 groups clearly separated. The group 1 has 6 points such that the sum of X1 and X2 coordinates is equal to 15 for each point. Moreover, in this group, there are 3 points such that the sum of X3, X4 and X5 is 0, and is equal to 6 for each the another 3 points. The group 2 has 6 points such that the sum of X3, X4 and X5 coordinates is equal to 0 for each point. Besides, in this group, there are 3 points such that the sum of X1 and X2 is 0, and is equal to -4 for each the another 3 points. Finally, the group 3 has 6 points such that the sum of X1 and X2 coordinates is equal to 0 for each point. Moreover, in this group, there are 3 points such that the sum of X3, X4 and X5 is 15, and is equal to 24 for each the another 3 points. All coordinates were perturbed with weak gaussian noise in order to introduce a small amount of variability inside each group. At each group the variable X6 is assigned randomly according to a Gaussian of mean zero and standard deviation 0.5. The configuration of the points is such that we expect that in reduction of dimension only the first dimensions are necessary to reveal the arrangement of the three groups. It can be seen in Figure 1 where the two leading components of kernel PCA are represented. We can see the group 1 (represented by triangles up and circles) on the negative part of the first principal axe, group 2 (represented by plus signs and by cross) in the central part and the group 3 (represented by diamonds and triangles down) on the positive part. Kernel PCA analyzing the toy example. Variables are represented by vectors that indicate the direction of maximum growth in each variable. Figure 1 shows samples and the variables from X1 to X5 at each sample. Variables are represented by vectors that indicate the direction of maximum growth in each variable. In fact, we can see that the vectors point to those groups characterized by higher values in each variable. For instance, the variables X1 and X2 point to the group 1, and the variables X3, X4, and X5 point to the group 3. Figure 2 shows the variable X6 at each sample, we can observe that this variable is poorly represented and has no preferred direction towards any group. Kernel PCA analyzing the toy example. Variable X6 is poorly represented and the direction of maximum growth of this variable shows no trend to any group. A natural extension of the above procedure is the representation of linear combinations of input variables. Details can be found in section 3.2. With the aim to show this property we displayed in Figure 3 the samples and the linear combinations X1 + X2 and X3 + X4 + X5 at each sample. Linear combinations are represented by vectors that point to the direction of maximum growth in each of the linear combinations. We can observe that at each sample vectors point to those groups with higher values in each of linear combinations. For example, vectors representing X1 + X2 point to group 1, and vectors representing X3 + X4 + X5 point to group 3. Kernel PCA analyzing the toy example. Linear combinations of variables are represented by vectors that indicate the direction of maximum growth in each of the linear combinations. We illustrate the representation of variables by analyzing the dataset in . We apply kernel PCA and representation of variables to the genomic data and FA data. Firstly, we compute kernel PCA by analyzing only gene expression level data. 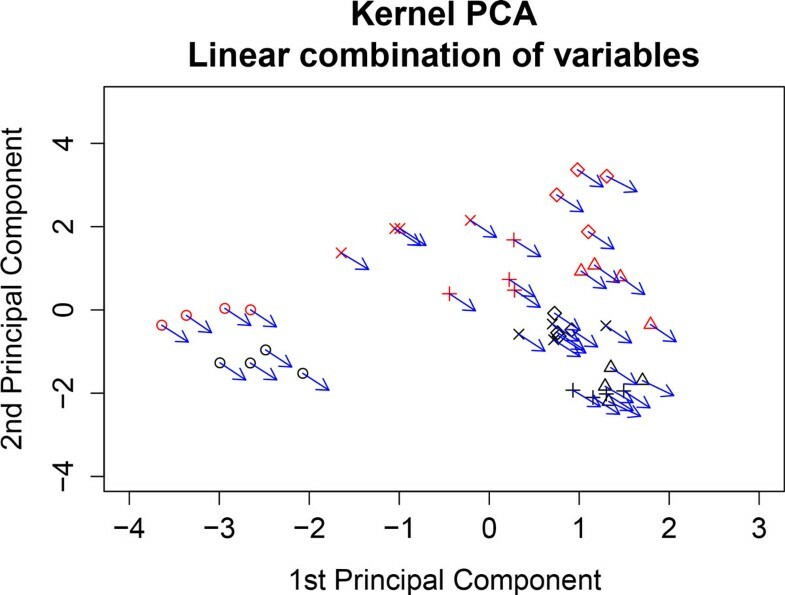 Figure 4 shows the two leading axes of kernel PCA. We can observe that the genotypes are clearly separated (WT samples are represented in black and PPAR samples in red). Diet representation is: ref diet is represented by the letter x; coc diet by circles; sun diet by diamonds; lin diet by plus signs; and fish diet by triangles). Figure 4 shows the AOX (blue vector) and CAR1 (green vector) genes. Vectors indicate the direction of maximum growth of the gene expression at each sample point. Thus, we can observe that AOX increases towards WT and CAR1 towards PPAR. These results are in agreement with those found in  and . 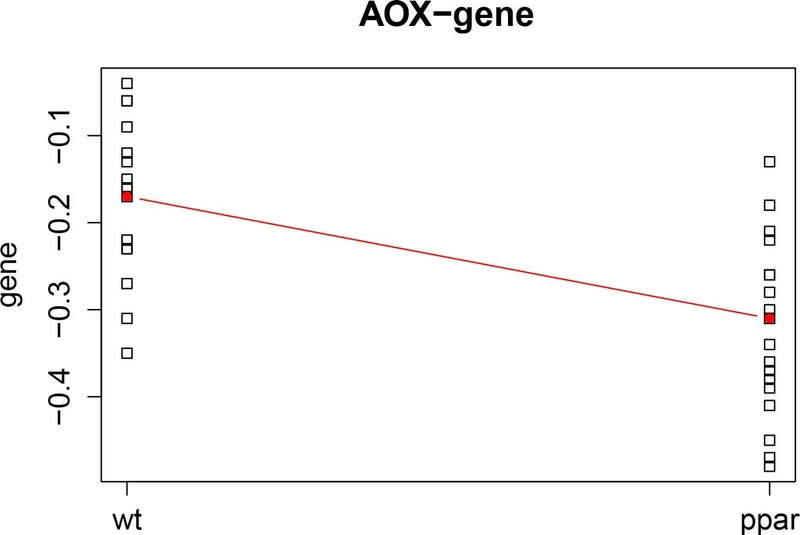 Figure 5 and Figure 6 show the profiles of the medians of the expression of AOX and CAR1 grouped by genotype. We can observe that these profiles agree with the kernel PCA representation. 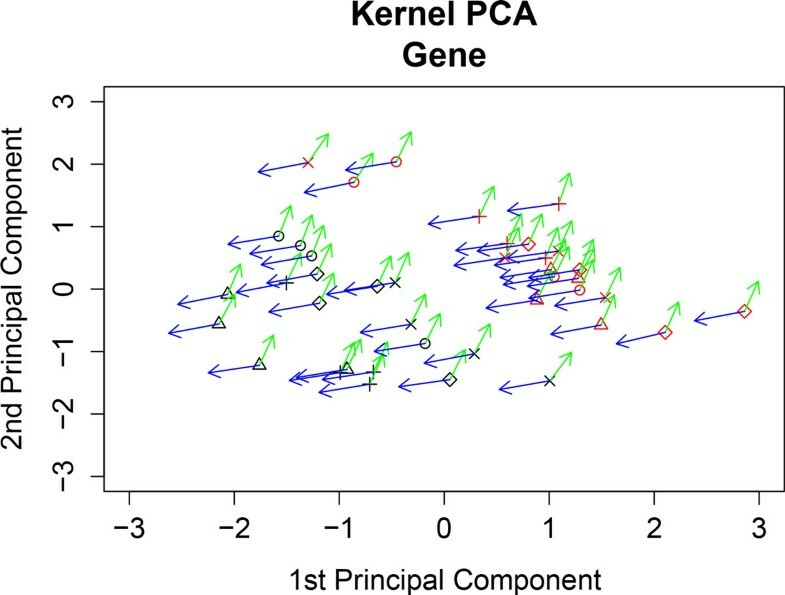 Kernel PCA of gene expression. The genes AOX (blue vector) and CAR1 (green vector) are represented at each sample point. WT samples are represented in black and PPAR samples in red. Diet representation is: (ref) diet by the letter x; (coc) diet by circles; (sun) diet by diamonds; (lin) diet by plus signs; and (fish) diet by triangles. AOX gene profile. Profile of the median gene expression of the AOX gene. CAR1 gene profile. 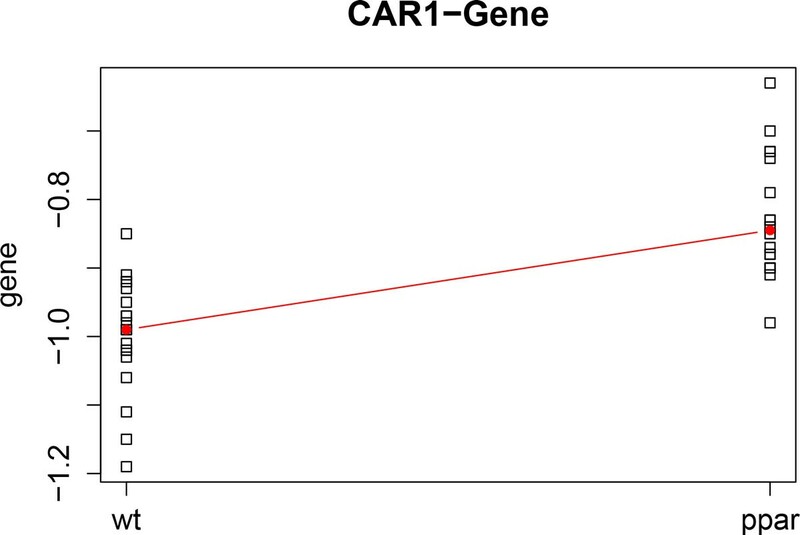 Profile of the median gene expression of the CAR1 gene. Secondly, to compare results, we compute kernel PCA analyzing only FA levels. In Figure 7 we can observe that the sample points are separated by genotype, but we can also observe that the samples with coc diet (a diet with hydrogenated coconut oil as a saturated FA diet) form a cluster. Figure 7 shows C20.2ω.6 (green vector) and C16.0 (blue vector) FAs. It reveals higher levels of C20.2ω.6 towards PPARα-deficient clustered samples (red) and that levels of C16.0 are higher towards the WT cluster of samples (black). 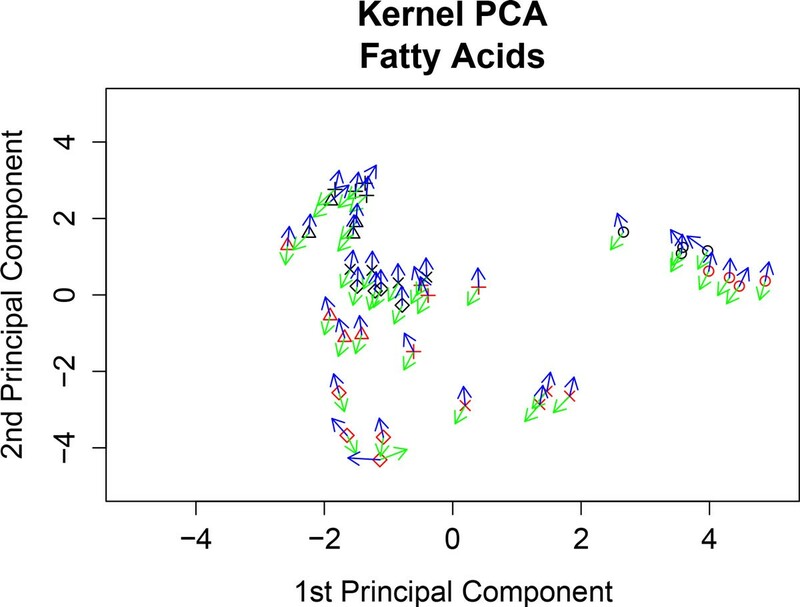 Kernel PCA of fatty acid concentrations. The fatty acids C16.0 (blue vector) and C20.2ω.6 (green vector) are represented at each sample point. WT samples are represented in black and PPAR samples in red. Diet representation is: (ref) diet by the letter x; (coc) diet by circles; (sun) diet by diamonds; (lin) diet by plus signs; and (fish) diet by triangles. These results are also in agreement with those found in  and . Figure 8 and Figure 9 show the profiles of the medians of the concentrations of C16.0 and C20.2ω FAs, grouped by genotype. We can observe that these profiles agree with the kernel PCA representation. 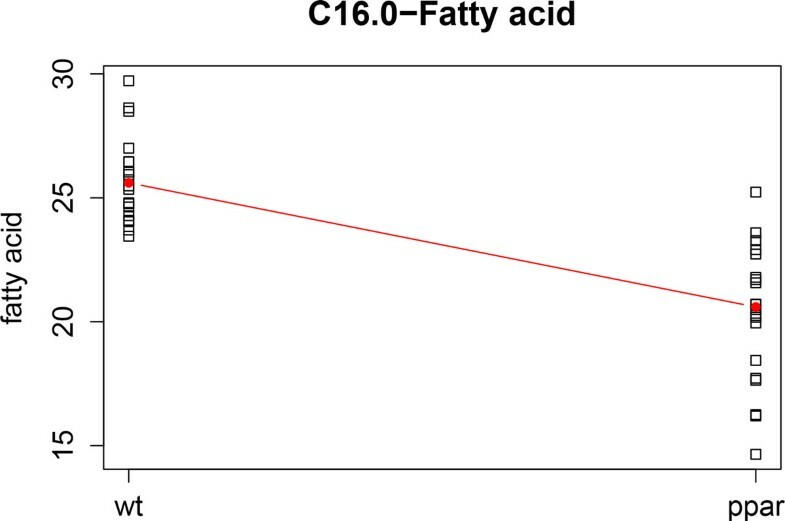 C16.0 fatty acid profile. Profile of the median concentrations of the C16.0 fatty acid. 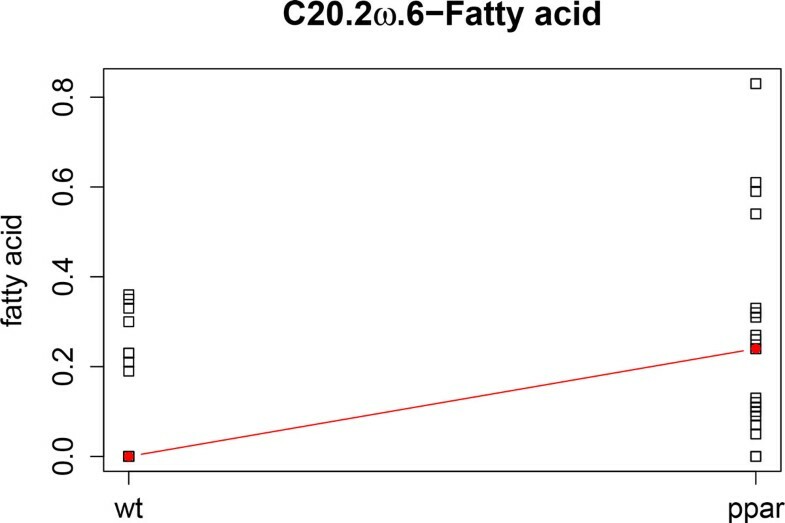 C20.2 ω .6 fatty acid profile. Profile of the median concentrations of the C20.2ω.6 fatty acid. is a kernel on X 1 × X 2 × X 1 × X 2 . Here, x 1 , x 1 ′ ∈ X 1 and x 2 , x 2 ′ ∈ X 2 . Z = K ( y 1 , x 1 i , y 2 , x 2 i ) m × 1 = k 1 ( y 1 , x 1 i ) + k 2 ( y 2 , x 2 i ) m × 1 .
d Z s i d s s = 0 = ∂ K l ( y l , x l i ) ∂ y l k y l = a l .
Then, formula (1) allows us to display variables that belong to any of the datasets over the kernel PCA representation of samples, simultaneously. Continuing with the same nutrigenomic study, we compute kernel PCA by analyzing both datasets simultaneously; that is, gene expressions and FA concentrations. We observe that the genotypes are clearly separated (WT is represented in black and PPAR in red) and also mice with the coc diet form a cluster of both genotypes; see Figure 10. Also, Figure 10 shows AOX (black vector) and CAR1 (green vector) genes, and C20.2ω.6 (blue vector) and C16.0 (red vector) FAs. It reveals higher expression of CAR1 and higher concentrations of C20.2ω.6 towards the PPAR cluster. In contrast, AOX gene expression and concentrations of C16.0 are higher towards the WT cluster. These results are in agreement with those found in the individual kernel PCAs above. 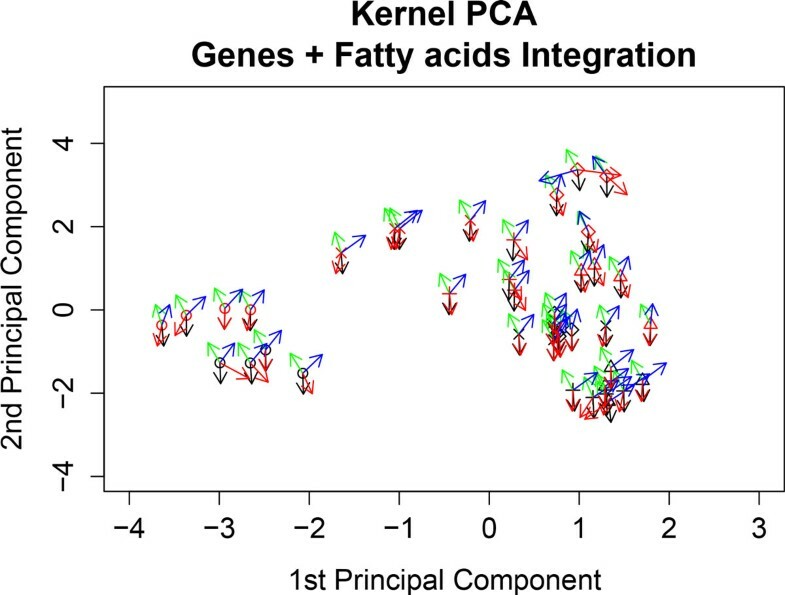 Kernel PCA analyzing gene expression and fatty acid concentrations simultaneously. The genes AOX (black vector) and CAR1 (green vector) and fatty acids C20.2ω.6 (blue vector) and C16.0 (red vector) are represented at each sample point. The WT samples are represented in black and the PPAR samples in red. Diet representation is: (ref) diet by the letter x; (coc) diet by circles; (sun) diet by diamonds; (lin) diet by plus signs; and (fish) diet by triangles. d Z s i d s s = 0 = ∑ t = 1 l ∂ K ( y , x i ) ∂ y k t y = a . Then, formula (1) allows us to represent any linear combination of input variables. To illustrate this procedure we have analyzed the genes GSTpi2, CYP3A11 and CYP2c29. These genes are involved in the functioning of detoxification . We perform kernel PCA analyzing both dataset simultaneous and represent the sum of the expressions of the genes GSTpi2, CYP3A11 and CYP2c29. Figure 11 shows sample points and the vector corresponding to the sum of the three gene expressions is attached to each point. The vector indicates the direction of maximum growth of the sum of the expressions. We observe that the sum of the expressions increases towards the fish diet. This is in agreement with the findings in . Representation of linear combinations of input variables. The sum of the expression of the genes: GSTpi2, CYP3A11 and CYP2c29 is represented. These genes are associated with detoxification. Wild type samples are represented in black and PPAR samples in red. Diet representation is: (ref) diet by the letter x; (coc) diet by circles; (sun) diet by diamonds; (lin) diet by plus signs; and (fish) diet by triangles. Our procedure for representing input variables on the two-dimensional subspace expanded by the two main eigenvectors of C ̃ , displays the variables as vectors whose direction is the direction of maximum growth of the variable at a given point; in particular, at the sample points. So, if we set a direction in this plane, given by a vector w, we can search for input variables whose representation on the kernel PCA plane are correlated with this direction. Let us suppose that we observe clusters of samples in the kernel PCA representation; then an interesting direction can be given by the vector defined by any two cluster centroids. R k : = 1 m ∑ i = 1 m cos w i , ( d σ k d s s = 0 ) x i . Finally, we order all the variables according to R k and we can select those with higher values and also those with lower values. Thus, in this way, for each sample cluster, we can find the correlated variables with higher and lower values. Knowledge of such variables can improve the biological interpretability of the results. A natural extension of this procedure is to take as w the vector corresponding to one of the input variables. 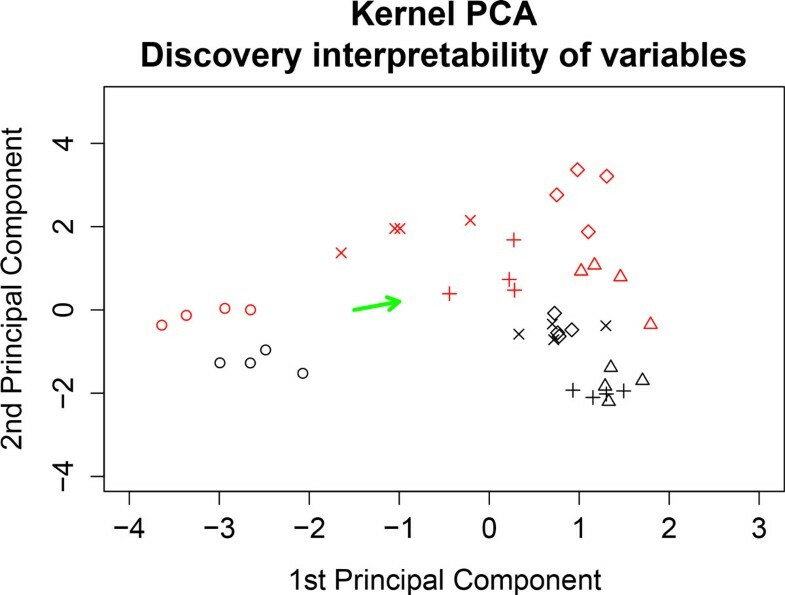 Then, if we know that a certain input variable is useful for interpreting the kernel PCA representation, we can search for other input variables whose representation on the kernel PCA plane are correlated with this feature. If we are integrating multiple datasets, we can search for correlated variables in each dataset. To illustrate this procedure. We have selected a preferred direction in the kernel PCA plane. Figure 12 shows this direction (green vector). This direction represents variables that are less expressed in samples with the coc diet than in those with other diets. Tables 1 and 2 summarize the genes and FAs that are most correlated with the selected direction. Kernel PCA analyzing gene expression and fatty acid concentrations simultaneously. The green vector represents variables that are expressed less in samples with the coc diet. It is defined by two cluster centroids: the left-hand cluster is the coc diet; and the right-hand cluster is comprised of the other diets. Fatty acids: correlation with the preferred direction. Fatty acids. Mean and standard deviation of the Rk measure of the strength of correlation with the preferred direction. Genes: correlation with the preferred direction. Gene codes. Mean and standard deviation of the R k measure of the strength of correlation with the preferred direction. In Table 1, we can observe that FAs with negative correlation, such as C16.1ω.7, C20.3ω.9 and C18.1ω.7, represent FAs with higher concentrations in samples with the coc diet. 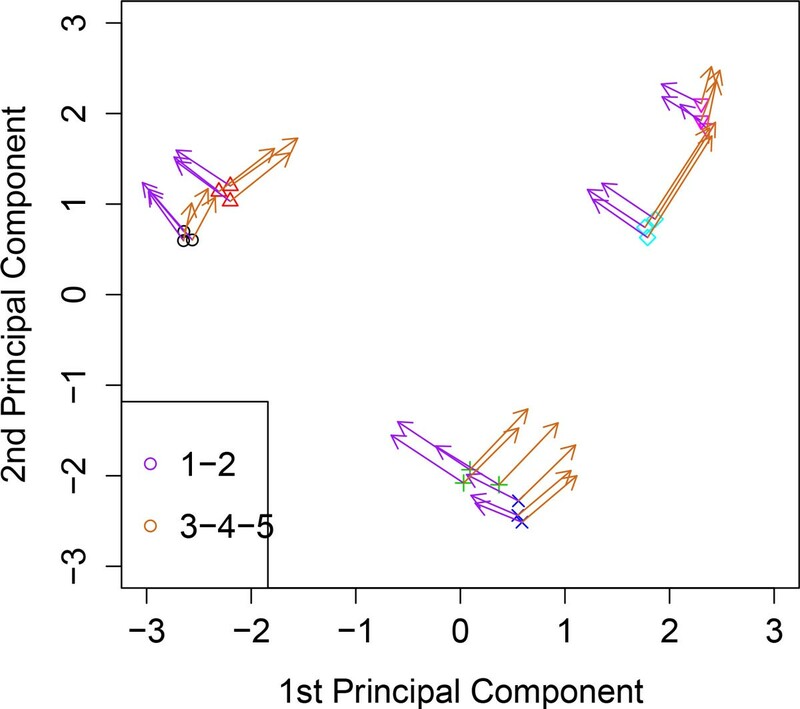 In contrast, FAs that are positively correlated, such as C22.4ω.6, C18.2ω.6, C18.3ω.3 and C22.5ω.6, represent FAs with higher concentrations in samples with other types of diet. Furthermore, in Table 2, we can observe that genes with negative correlation at the top of the table, such as S14, ACC2 and LPL, are more highly expressed in samples with the coc diet, whereas genes at the bottom of the table, that are positively correlated, are less expressed in the coc diet samples. These results are in agreement with those found in . With the rapidly increasing amount of genomic, proteomic, and other high-throughput data that is available, the importance of data integration has increased significantly recently. Biologists, medical scientists, and clinicians are also interested in integrating the high-throughput data that has recently become available with previously existing clinical, laboratory and biological information. Kernel methods, in particular kernel PCA, constitute a powerfully methodology because they allow us to reduce dimensionality and integrate multiple datasets, simultaneously. Moreover, in this paper we have introduced a set of procedures to improve the interpretability of kernel PCA representations. The procedures are related to the following aspects: 1) representation of variables; 2) linear combination of representations of variables; 3) data integration and representation of variables; and 4) revealing the interpretability of input variables. Our procedure is a kernel-based exploratory tool for data mining that enables us to extract nonlinear features while representing variables. Implying ϕ ( x ) , ϕ ( y ) = k ( ⋅ , x ) , k ( ⋅ , y ) = k ( x , y ) . After completion we can turn our feature space into a Hilbert space ℋ k . The space ℋ k is the reproducing kernel Hilbert space (RKHS) induced by the kernel function k.
K ̃ = K - 1 m K 1 m 1 m T - 1 m 1 m 1 m T K + 1 m 2 ( 1 m T K 1 m ) 1 m 1 m T .
C ̃ = 1 m ∑ j = 1 m ϕ ̃ ( x j ) ϕ ̃ ( x j ) T .
V ̃ = ∑ i = 1 m α ̃ i ϕ ̃ ( x i ) . The solution α ̃ k , k = 1 , . . . , r , are normalized by normalizing the corresponding vector V ̃ k in ℋ k , which translates into λ ̃ k α ̃ k , α ̃ k = 1 .
ϕ ̃ ( y ) , V ̃ k = ϕ ( y ) - ϕ ̃ , V ̃ k = ∑ i = 1 m α ̃ i k ϕ ( y ) - ϕ ̄ , ϕ ( x i ) - ϕ ̄ = ∑ i = 1 m α ̃ i k ϕ ( y ) , ϕ ( x i ) - ϕ ̄ , ϕ ( x i ) - ϕ ( y ) , ϕ ̃ + ϕ ̄ , ϕ ̄ = ∑ i = 1 m α ̃ i k K ( y , x i ) - 1 m ∑ s = 1 m K ( x s , x i ) - 1 m ∑ s = 1 m K ( y , x s ) + 1 m 2 ∑ s = 1 m K ( x s , x t ) . Z = K ( y , x i ) m × 1 .
where V ̃ is a m × r matrix whose columns are the eigenvectors V ̃ 1 , … , V ̃ r .
This work was partially supported by COST-BMBS, Action BM1006 "Next Generation Sequencing Data Analysis Network", SeqAhead. The publication costs for this article were partially funded by MEC-MTM2008-00642. FR suggest the combination of Kernel PCA and variable representation and designed the study. JMO was responsible for the development of the procedure. EV implemented the approach, coded the procedures and prepared analysis and results. FR and EV wrote the manuscript.